PR for Real. One Man's Quest to Military Press Half his Bodyweight and the Mind Spot. PR for Real. One Man’s Quest to Military Press Half his Bodyweight and the Mind Spot. One of the tasks you need to complete in order to pass Level II of the RKC is to press a kettlebell that is equivalent to half of your body weight. This definitely can be a daunting task. After training hard, I achieved this goal with a “not so beautiful press” about two months before my level II certification; and then I messed up big time. Where I should have been refining my technique with the heavy kettlebell right up until testing, I didn’t practice it at all and I lost the ability to press the weight. My saving grace came from Master RKC Instructor Mark Reifkind who worked with me, refined my technique and got me to press the kettlebell. I was then able to pass my Level II certification. Below is the excerpt from the article. PR for Real. One man’s quest to Military Press half his bodyweight. And the Mind Spot. Let me lead with this: I have nothing against training for Pr’s( personal records). 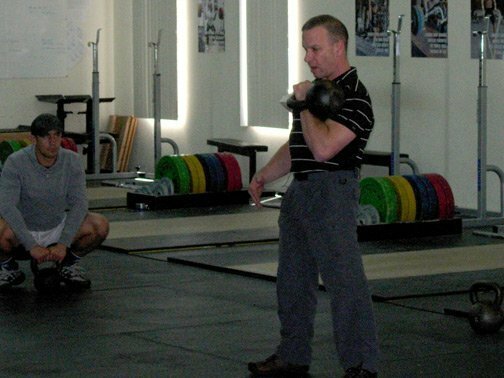 In fact, it was the hallmark of my training in powerlifting for 15 years as it is a key component of the Westside Barbell method, my preferred system of systematic torture for powerlifting progress. Every week in WSB land, we strove to get a new pr in some special exercise or variation of a competition lift. PR’s for wide grip board press, close grip, 3 board, 2 board, floor press close, floor press wide, etc. etc. We knew,especially on max efforts( close to or above 100% of personal best) that one could only increase loads for one, perhaps two, weeks before progress would stall out, or, go backwards.